Seriously? OMG! WTF?Ice-T/ Coco Archives - Seriously? OMG! WTF? Two of the biggest West Coast Rappers are working on a project together on the East Coast. 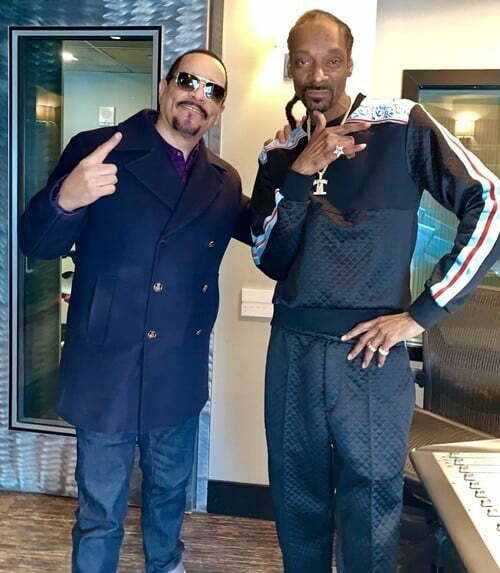 Ice T revealed today that Snoop Dogg is guest starring on an upcoming episode of Law & Order: SVU. Ice T did not say if Snoop is a good guy or a bad one on the NBC procedural, but he says it is titled Diss. I am sure it will be the shiznit and nothing to diss. It is amazing that the two men, who have had their run-ins with the law, are working on a cop show. The irony is not lost on me. It also shows people do change. It just dawned on me, when I was trying to figure out if they worked together before, that I interviewed both of them on the red carpet for Flavor Flav’s Comedy Central Roast. It is a freezing 7 degrees in NYC today, but that did not stop Law & Order: SVU from filming outside today. Ice T shared a video of what it looked like and one of the crew members had ice on his beard. It was so cold that Jennifer Esposito’s face was stuck to the actor’s jacket. I am sure Coco will understand. If not, her anger will warm things up. On a positive note, at least they were not filming a summer episode because it would have been a lot colder if they had to film those scenes in shorts and t-shirt? Then again, they say artists suffer for their art and these actors are suffering. Stay warm. I will be thinking of you when it hits 77 degrees today in Los Angeles. After Ice T shocked the world and revealed he has never tried coffee or a bagel, he finally tried them thanks to the dating site Coffee Meets Bagel. What did he think? Even though he is NYC, where you can get some of the best coffee and bagels, it sounds like they did not bring him anything good. What is wrong with them? They should have gotten him the best and not something from Starbucks. Sorry, but in NYC, you have so many options, you don’t get that stuff at a chain. Take advantage of the city. So Ice, I say try a toasted sesame seed bagel with melting cream cheese and you will be hooked. I am from The Bronx, not a huge bagel eater, and even I love those. Ice-T was arrested this morning for going through a toll plaza without his EZ Pass. Then accoding to The New York Daily News, because the car he was driving was not registered to him they arrested him. Well if it was on the Jersey side, they are not as nice! NYC humor! I don’t know about you, but I don’t remember ever seeing Ice Cube and Ice-T together. Do you? Well today they were both on Today promoting their different projects at different times and the NBC new shows though it would be cool to take a photo of them together. They were right. The rappers turned actors go together like, well, ice t and ice cube!